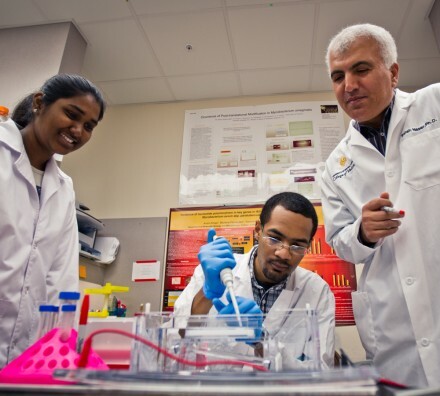 UCF College of Medicine professor Dr. Saleh Naser soon will participate in a clinical trial to test whether a new antibiotic therapy acquired by RedHill Biopharma can be used to treat Crohn’s disease patients. The FDA-approved phase III trial is expected to commence within weeks by RedHill Biopharma, which licensed Naser’s DNA technology for detecting Mycobacterium avium subspecies paratuberculosis, known as MAP. It is believed to be associated with Crohn’s disease. RedHill Biopharma developed the anti-MAP antibiotic regimen known as RHB 104. Crohn’s disease is a chronic inflammatory disease of the gastrointestinal tract characterized by cramping and diarrhea. Naser developed and patented a way to detect MAP from milk, blood and tissue clinical samples. The bacterium is known to cause inflammation in the intestines of cows. It is also linked to Crohn’s disease, although its role has been debated for more than a century. Naser believes MAP is an underlying cause of the disease. RedHill will be enrolling 240 subjects from the United States, Canada and Israel in this double blind clinical trial in which blood and intestinal biopsy specimens from Crohn’s patients will be tested for MAP before, during and following the one-year treatment with the antibiotic RHB 104. Naser is looking forward to the trial and hopes this will end the academic debate regarding MAP and Crohn’s disease. “I am ecstatic to be part of a team, which will help determine whether or not MAP is associated with Crohn’s disease; certainly a final answer to a one hundred-year old controversy,” Naser said. Naser joined UCF in 1995 and has been a faculty member in the medical college since its foundation. He teaches clinical chemistry and infectious processes in the Burnett School of Biomedical Sciences within the medical school. He also serves as the graduate coordinator for three masters programs in the College of Medicine.